Thank you for simplifying this, MaiTai. I like the weight that the pearls add to the scarf. 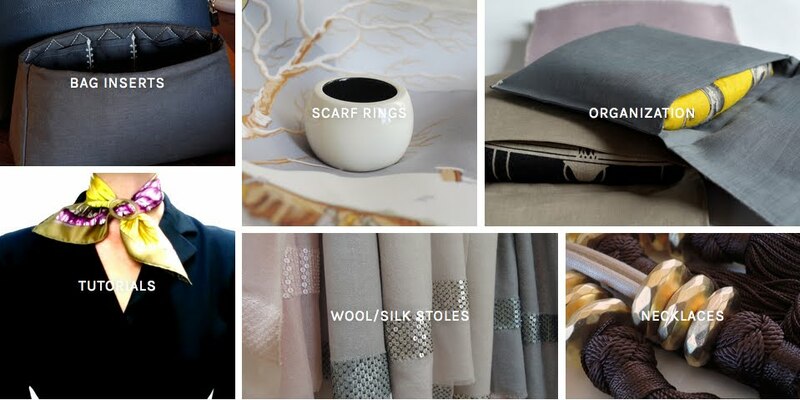 It can entirely change the look of a scarf in seconds. Love the music, too, but this American will be in your native country soon. I just knew that the pearls would look amazing with lfasdv. Thank you for doing this for us dear MT, your how to's are always so helpful!. PS love Gershwin's An American in Paris. CS, please keep me posted! booksnchocolate, I'm not American, but am in Paris! Tres tres chic MaiTai! I have loads of pearl necklaces now I have another use for them too - thank you!! So simple and so smart! Thanks a lot, dear MaiTai! I love your videos, my dear MaiTai! They are so profissional! The pearls look lovely with the scarves. I am just a bit afraid that the closure of the necklace may pull a thread of the scarf. Will give it a try though. Wishing you a great week ahead. Warm hugs, Manuela. It seems you are heading towards the film industry, your how to's are really professional works and Cecilia is obviously doing her job! Btw, I am figthing to do something with my long pearl strand without closure ... the battle is not finished yet, lol. Beautiful and so easy, I love it. Oh,how wish I was an American in Paris....right now!!! Such a great video from our girl with a pearl necklace. It really does help clarify several steps along the way to this fresh look. Bravo and a big thank you for taking the time to produce! Happy week ahead. Manuela, so true, one always needs to be mindful about sharp edges! Lilian, let me know if the problem with the closed necklaces persists. Good luck! Jamais, much love to the french girl in America! I really could not get the video to work, so I just pushed it along manually and missed the music :( The concept is wonderful and so chic. Your next challenge may be to do it with a double strand and/or two different color strands. Wonderful as always and I applaud your creativity! Great idea to use double strands or multicoloured ones, many thanks dear gracekelly! Sorry re the technical problems, and I don't even know how to solve them, dang. Thank you, dear Samantha. Have fun! Came back to watch again as I was trying with the stand closed up and it was not working. Now the video, music and pearls are working the way they should :) Such an interesting look! Dear gracekelly, relieved to hear it all worked in the end, many thanks for the update! It has been a long time since I last visited your blog (too much working!). Now I have enjoyed your different pages - thank you! They are all very inspiring and delightful to watch as ever! I haven't thought of using a necklace on a gavroche earlier, but now I am going to try! Your films are always very instructive and you make it look simple and easy to follow. The font of MaiTai at this video - is marvellous! Vraiment! Oh my heavens! I cannot believe how stylish this look is! I am a jewelry designer and this look has totally inspired me for something new! Thank you very much! I just found your site! You are one fabulous girlie! Wondering what the length of the pearl necklace you showed? Such a great, classy look. You are my new fashion idol! 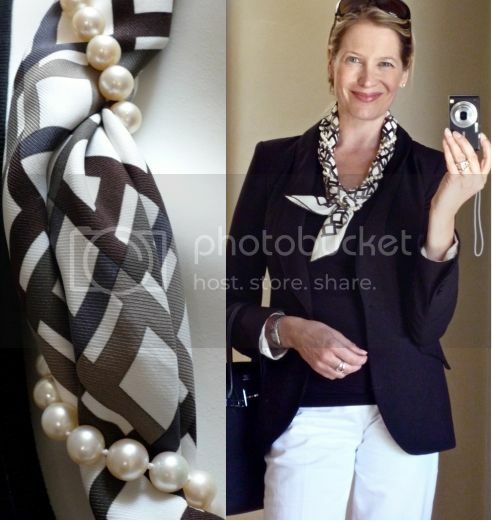 I loved your video, what a fabulous way to combine wearing scarf And pearls. Loved this video, I had to clap at the end. Many thanks ! So happy to hear, many thanks for the lovely and kind comment! You have great classic style and versatility ! Just now, I greatly enjoyed your video for utilizing a Hermes scarf as a shrug. Maitai, may I ask if a Twilly works with pearls ?